Unless Baghdad is willing to hire, equip, train, and supply local security forces and make concessions on Sunni political demands, it will not be able to unite Anbari Sunnis to fight against ISIS. On May 17, 2015, the city of Ramadi, capital of Anbar, Iraq's largest province, fell to the Islamic State of Iraq and Syria (ISIS). Soon after, the Iraqi government chose to send the Hashid ash-Sha'bi (Popular Mobilization Force) into Anbar to help Iraqi Security Forces (ISF) liberate the city from ISIS control. Thus far, the tactic has been a manifest failure. Conventional wisdom in Washington and other policy centers attributes this failure to the fact that Anbaris are largely Sunnis, hence do not trust the mostly Shiite Popular Mobilization Force enough to fight with it against ISIS. Yet for over a year, Anbari leaders have been asking the central government in Baghdad to increase arms supplies, training, and payments to the local security forces so as to enable them to fight ISIS, only to be turned down time and again. This response reflects the belief in government circles that they can replicate the success of the 2006 Anbar Awakening, which helped U.S. and Iraqi forces defeat al-Qaeda in Iraq (AQI) and the domestic Sunni uprising through a Baghdad-run, clear-hold-and-build military campaign. This, however, is a dangerous misconception that is bound to cost Iraq dearly. The conventional wisdom regarding the Anbar Awakening is that U.S. tactics were largely responsible for gaining the trust of local Sunnis, thus enabling Washington to partner with them in the counterinsurgency fight. A surge of U.S. combat troops secured urban areas, then, one-time enemies became trusted, and locals provided necessary intelligence to root out terrorists and rebuild the local forces with more oversight. Taking their cue from this analysis, senior leaders in Baghdad believe that the Iraqi Security Forces can lead operations into Ramadi, hold strategic locations, and build the requisite trust needed to gain control over local security forces. In Baghdad's view, if Washington succeeded in doing this without a deep understanding of local knowledge and customs, Iraqis should be able to do so with experienced Shiite fighters. In a recent interview, Hadi Ameri, leader of the Iraqi Badr political party and de facto commander of the Popular Mobilization, made the case for this approach, claiming that in the fight against ISIS, it was preferable to use Shiite militiamen, who had experience fighting the Saddam regime along with U.S. occupation forces, than to try to train and equip tribal fighters in Anbar. The logic follows that if Baghdad is the patron of a new Anbar Awakening, then any future security arrangement between Shiite-led Baghdad and Sunni provinces will have greater longevity. Yet, if the Iraqi government assumes that U.S. counterinsurgency tactics were the decisive factor in the success of the Anbar Awakening, it will likely fail, not only because it lacks the political will to compromise with the Sunnis but also because the Shiite-led Iraqi government underestimates the differences between the political environment in 2006 and today. The decisive factor in the success of the Anbar Awakening was that al-Qaeda in Iraq was seen by most Sunnis, especially the Islamists within the insurgency, as a greater enemy than the U.S. forces. Nor was AQI the only enemy: The sectarian government in Baghdad, which Sunnis saw as a pawn of Shiite Tehran, was an enemy as well. In these circumstances, Washington became the lesser of three evils and the most willing to compromise. Since U.S. forces held significant sway over the formation of the Iraqi Security Forces and Iraqi government policies, Sunnis assumed that joining the security forces to defeat AQI and partnering with Washington would give them more power over Baghdad's policies in Sunni areas. With the U.S. forces out of Iraq, the ball is exclusively in the Iraqi government's court: Unless Baghdad is willing to hire, equip, train, and supply local security forces and make concessions on Sunni political demands—more jurisdictional autonomy, equal application of de-Baathification laws, releasing prisoners—it will not be able to unite Sunnis to fight against ISIS. The Iraqi government is still seen by many Sunni stakeholders as a greater enemy than ISIS. However, the Shiite-led Baghdad government has thus far failed in Anbar not because it has not provided adequate weapons or equipment or because it is a sectarian government taking orders from Iran, as the popular narrative in Sunni and some Western media outlets holds; rather, there are three critical reasons for this failure: other more urgent priorities for Baghdad, mutual distrust between it and the Sunnis, and lack of Sunni unity. 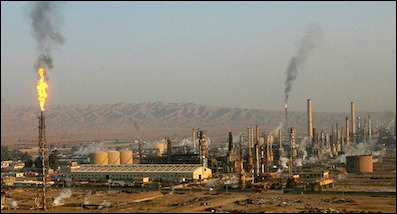 ISIS launched campaigns to take Erbil, Sinjar, Tikrit, and Baiji (with its important and lucrative oil refinery, pictured here). For the Baghdad government, Anbar was less of a priority than stopping this advance north of Baghdad. In addition, the drop in oil prices in 2014 meant that the Iraqi government had less cash to purchase weapons to send to Anbar. Since 2013, the Iraqi army's seventh and first divisions, and later units from the eighth division, have been actively engaged against ISIS and other Sunni insurgents. One senior Anbari commander has conceded that weapons and supplies were not an issue until late 2014 when the government diverted materiel to support security operations in the northern provinces of Ninevah, Salahedin, Kirkuk, and Erbil after the fall of Mosul to ISIS in June 2014. The fall of Mosul, Iraq's second largest city, shocked the Baghdad government and many world chancelleries. Anbar was less of a priority than stopping ISIS's advance north of Baghdad. ISIS then launched campaigns to take Erbil, Sinjar, Tikrit, and Baiji (with its important and lucrative oil refinery). The national police were also more active in these areas than in Anbar, and the Shiite and Kurdish constituencies in Ninevah and Salahedin provinces made those areas more of a priority for Baghdad. Furthermore, the drop in oil prices in the second half of 2014 meant that the Iraqi government had less cash to purchase weapons. With Kurdish and Shiite politicians in power, and the majority of Sunni politicians originating from Baghdad, Ninevah, Salahedin, and Diyala, it is no surprise that Anbar was not supported. A major problem in Anbar's security relationship with Baghdad has been the local Iraqi police. Baghdad's distrust of the Anbari police increased after peaceful protests began there in December 2012. Sunni protesters held sit-ins in Fallujah and Ramadi that spread into other Sunni provinces. Former prime minister Nouri Maliki, who was preparing his party for the important provincial elections in the spring of 2013, campaigned on security issues and protecting Iraqis from the ISIS spillover from Syria. Maliki had the Iraqi ministry of interior and the courts issue arrest warrants for protest leaders and accused the protesters of harboring ISIS and Baathist operatives. These protest leaders included Sheikh Ahmad Abu Risha, leader of the Iraqi Awakening Conference (formerly the Anbar Awakening Council). However, the local Iraqi police, under the influence of the Anbar Provincial Council and local tribal leaders, did not follow through on the arrest warrants. Instead, Maliki relied on his counterterrorism forces and SWAT teams to enter Anbari cities. Baghdad's distrust of the Anbari police increased after peaceful protests began there in December 2012. 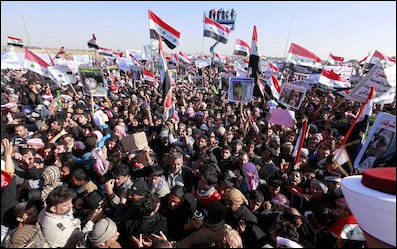 Sunni protesters held sit-ins in Fallujah and Ramadi that spread into other Sunni provinces. Former prime minister Nouri al-Maliki had the Iraqi ministry of interior and the courts issue arrest warrants for protest leaders and accused the protesters of harboring ISIS and Baathist operatives. Before Ramadi fell to ISIS in May 2015, senior leaders in the Iraqi government considered the new Popular Mobilization Forces the main vehicle for defense. Even Shiite religious leader Ayatollah Ali al-Sistani issued a statement after the fall of Ramadi saying that the offensive against ISIS "must always remain with the armed forces, the Hashid, and tribal fighters." After ISIS's takeover of Mosul in June 2014, Sistani's call to arms enticed thousands of Shiites into joining the popular mobilization. The government's insistence that the anti-ISIS offensive remain with the armed forces, popular mobilization, and tribal leaders, was similar to that of Washington in Ramadi in 2006: Security efforts must be a joint Iraqi army, coalition, and local Iraqi police effort. Many Anbaris, however, did not trust the Popular Mobilization Forces, which are largely linked to and led by Shiite militias. Baghdad promised that local Sunni fighters would be incorporated into the popular mobilization units and that the Anbari provincial council would have oversight responsibilities. There were even local tribal leaders who supported the use of popular mobilization forces to defend Ramadi. But the appointment of the Shiite general Ziyad Alwani as commander of the Popular Mobilization Forces in Anbar sent a clear message to Sunnis: You are not trusted. While many Anbari fighters respected the former Baathist general (a member of the important Alwani tribe with large families living in Ramadi and Fallujah), he was still a Shiite from the city of Hilla. Local fighters wondered why Baghdad did not choose one of the many competent Anbari generals to head the popular mobilization. Distrust between the government and the local police eroded any chance to motivate forces on the frontline in the fight against ISIS. That distrust weakens any attempt by Baghdad to recruit locals to their Shiite-led security operations. 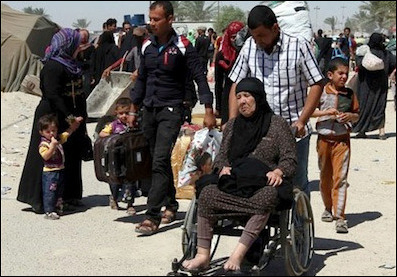 Civilians flee Ramadi after ISIS takeover, May 2015. Before Ramadi fell to ISIS, senior Iraqi leaders considered the new popular mobilization forces the main vehicle for defense. Many Anbaris, however, did not trust these forces, which are linked to Shiite militias. With the appointment of Shiite general Ziyad Alwani as commander of the Anbar forces, Baghdad sent a clear message to Sunnis: You are not trusted. After the 2013 provincial elections, the new Anbari government called on protesters to postpone demonstrations and give the political process a chance. This fractured the province's social and tribal cohesion. Some tribal leaders and fighters joined efforts to fight the forces in Fallujah and Ramadi. Others, such as Sheikh Ahmad Abu Risha sided with the ISF against what they claimed were ISIS advances. There was no clear direction or common interest uniting Anbaris as there had been during the 2006 Anbar Awakening. Different stake holders in the province entrenched themselves in their positions and were unwilling to compromise in order to fight ISIS, as they had done against al-Qaeda in Iraq a decade earlier. 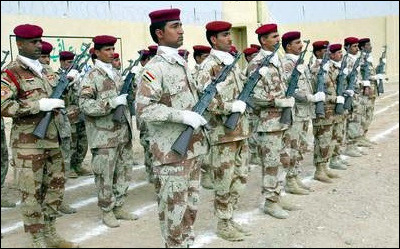 Since the majority of the ISF in Anbar was interconnected with local forces, these same divisions were reflected in the command and control of security operations. There were SWAT teams, counterterrorism forces, the Golden Division, Iraqi army, Iraqi police, Provincial Emergency Response battalions, and tribal fighters, all defending their ground from ISIS and Sunni insurgents but not in a coordinated effort. Since each of these forces were linked to ministries in Baghdad, the disorganization and separate chains of command ensured that there was no clear and unified policy on how to fight in Anbar. On top of that, there were increasing reports that arms provided to tribal fighters were sold on the black market with some even ending up in the hands of ISIS fighters. In theory, the Anbar Operations Command was supposed to coordinate all security efforts; however, this command was constantly on the defensive and could not conduct frequent offensive operations. Had Anbaris been more united and willing to subordinate their personal interests to a common goal, as they had done in 2006, then they would have been more effective in coordinating efforts to defend Anbari cities. It is also likely they would have used more sparingly the sufficient quantities of arms they had been provided. These Anbari divisions are still hindering Sunni efforts to gain full support from Baghdad. In hindsight, given local disunity, distrust, and low prioritization, it is no surprise that ISIS was able to take over so much of Anbar's territory, especially Ramadi. Yet despite the disunity, since the completion of U.S. troop withdrawal from Iraq in 2011, Sunnis have complained that they are not full partners in the political process and have pushed for more decentralization. The peaceful protests from December 2012 to December 2013, aimed at forcing the government to accept Sunni demands, were their first, largely united, strategy to achieve this goal. But the demonstrations actually widened the dividing lines along the whole spectrum of Anbari society, setting the stage for ISIS's exploitation of internal divisions. No Anbari leader is able to galvanize the local stakeholders to challenge ISIS seriously. Currently, no Anbari leader is able to galvanize the local stakeholders to challenge ISIS seriously as Sheikh Abu Risha did in 2006. Competing interests and different assessments of the threats and opportunities are keeping Sunnis from creating a united front. This disunity reinforces the Baghdad government's distrust and the attendant preference to supply the better organized and more motivated Kurdish and Shiite fighters in the northern provinces. But, Baghdad still has an opportunity to play a significant role shaping the outcome in Anbar, much as Washington did in 2006-07. Unfortunately, the Iraqi government has learned the same—but wrong—lessons as many in Washington did about the Anbar Awakening. Although important, it was not the U.S. military presence that enabled the Sunni alliance, but rather, it was the overlapping interests of Anbari leaders and the U.S. readiness to compromise and work together under Anbari leadership to rid the province of the AQI enemy. If Baghdad is interested in generating a new Sunni uprising against ISIS, it will first need to address the same fundamental factors, agree to compromise, and find a communality of interests. The government can do this by passing the National Guard law to formalize the role of local Sunni tribal militias and former military officers in the fight against ISIS, a step that would indicate to the Sunnis that Baghdad is serious about giving more powers to Sunni provinces to oversee their own security. It can also devote more money to salaries, weapons, and supplies to local fighters who have remained in the fight against ISIS but have been demoralized by Baghdad's distrust. As announced in summer 2015, Prime Minister Haider Abadi's reform initiatives to fight corruption and restructure the government could open political, institutional, and financial opportunities to show Anbar that Baghdad can be trusted. In return for compromise on the National Guard law and allowing Anbaris to take a lead in the fight, the government will enable the Shiite-majority Popular Mobilization Forces and the Iraqi army to play a supporting role against ISIS. But Baghdad's recent insistence that the Iraqi army and Popular Mobilization Forces play the leading role in liberating Ramadi as a precondition for supporting local troops is doomed to fail. Sterling Jensen is an assistant professor at the United Arab Emirates' National Defense College in Abu Dhabi. He served in Iraq's Anbar province, first as a contract linguist for the U.S. Army, then as a civilian foreign area officer for the U.S. Marines. The views in this article are his own. See, for example, Stephen Biddle, Jeffery A. Friedman, and Jacob N. Shapiro, "Testing the Surge: Why Did Violence Decline in Iraq in 2007," International Security, Summer 2012, pp. 7-40; Steven Simon, "The Price of the Surge," Foreign Affairs, May/June 2008; Marc Lynch, "Explaining the Awakening: Engagement, Publicity, and the Transformation of Iraqi Sunni Political Attitudes," Security Studies, Mar. 2011, pp. 36-72. Author telephone interview with an Anbari tribal leader of the 2006 Anbar Awakening, who is currently involved in security operations in Ramadi, May 29, 2015; Yaqin News (city of publication unknown), Apr. 9, 2015; Iraqi News Agency, May 17, 2015. Dijla TV (Iraq) interview with Hadi Ameri, YouTube, May 1, 2015. Author telephone interviews and e-mail exchanges with tribal, religious, and military leaders in Anbar, Apr.-June 2015. Author telephone interview with senior Anbari security force officer, June 15, 2015. Kirk H. Sowell, "Maliki's Anbar Blunder," Foreign Policy, Jan. 15, 2014. Maj. Neil Smith and Col. Sean MacFarland, "Anbar Awakens: The Tipping Point," Military Review, Mar./Apr. 2008. Elaph (London), May 17, 2015. Author telephone interviews with tribal leaders and mid- and senior level Anbari officers of the Iraqi police and emergency units, May 2015. Financial Times (London), May 27, 2015. Author interview with a senior protest organizer, Abu Dhabi, May 15, 2015. The Washington Times, June 8, 2015. Related Topics: Iraq, US policy | Sterling Jensen | Winter 2016 MEQ receive the latest by email: subscribe to the free mef mailing list This text may be reposted or forwarded so long as it is presented as an integral whole with complete and accurate information provided about its author, date, place of publication, and original URL.